The Downtown Denver Partnership has released its January 2019 Downtown Denver Economic Indicators Report, detailing current conditions spanning a variety of key indicators. The Report was released in unison with the Partnership’s Annual Economic Forecast Forum, which took place on January 17, 2019. Economic conditions in Downtown Denver remain generally positive, as low unemployment and healthy job growth continue throughout the area. Consumer spending increased, with strong performance in the largest categories of Restaurants and Hotels/other accommodations. Average weekly wages and total wages for Downtown Denver employees also increased. Demand for apartments remained strong, as the multifamily market showed increased rents and decreased vacancy, even in a year where over 1,000 new apartments were delivered. In both the office and retail real estate markets, vacancy rates fell as demand for quality space continued. Employment in Downtown Denver rose 4.1% between the second quarter of 2017 and the second quarter of 2018, 1.4 percentage points faster than the Metro Denver increase of 2.7%. Of the 11 supersectors in Downtown Denver, nine reported growth over-the-year. Education and Health Services and Information reported the fastest rates of growth, rising 14.3% and 12.4%, respectively. Professional and Business Services, the largest supersector by employment, reported the largest absolute increase in employment and added 2,381 jobs over-the-year, an increase of 5.8%. Average weekly wages for individuals working in Downtown Denver increased by 6.8% between the second quarter of 2017 and the second quarter of 2018 to an average of $1,739. The supersectors with the highest average weekly wage are Natural Resources and Construction and Professional and Business Services, which is also downtown’s largest supersector. The supersectors with the highest year over year growth were Information and Leisure/Hospitality. Total retail sales tax collections were 3.6% higher in the Downtown Denver area in the third quarter of 2018 compared with the prior year. Of the 11 retail trade categories, seven categories recorded increases in sales over-the-year, including the largest industry category in Downtown Denver, Restaurants. Restaurants collected $6.5 million in retail sales tax in the third quarter of 2018, an increase of 6.8% over-the-year. Hotel and other accommodation services, the second largest industry category, increased 9.3%. Effective Rent per Unit in the Downtown Denver apartment market increased slightly from $1,818 to $1,855 between 2017 to 2018. Apartment vacancy decreased by almost a percentage point over the year, ending 2018 at 11.2%. Increasing rent and decreasing vacancy was observed during the same time total inventory increased by 1,028 units, showing strong demand for apartment units in Downtown Denver. 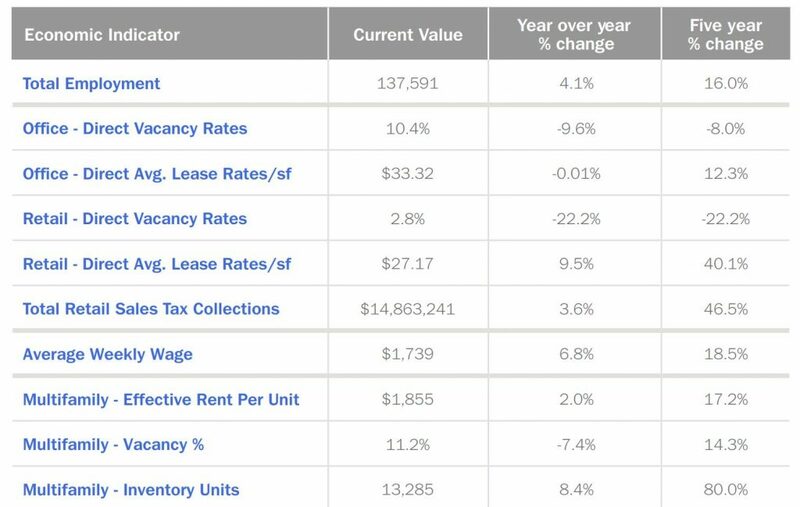 Effective rent per square foot also increased slightly, ending the year at $2.23/sf. Direct office vacancy rates fell throughout the Metro Denver area over-the-year. Office vacancy decreased 1.1 percentage points in Downtown Denver, a higher decrease than Metro Denver’s 0.5 percentage points drop between the fourth quarters of 2017 and 2018. The average lease rate remained flat in both the Downtown Denver and Metro Denver office markets. The retail vacancy rate decreased by 0.8 percentage points in Downtown Denver while the average lease rate increased 9.5% to $27.17 per square foot.